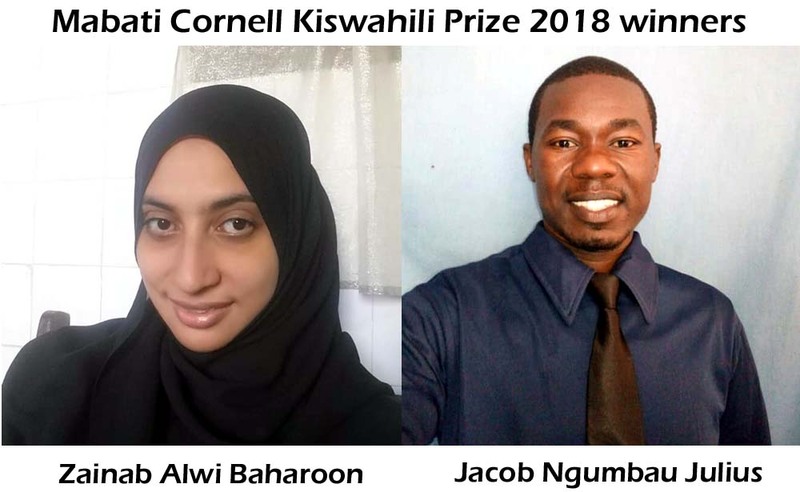 The Mabati Cornell Kiswahili Prize 2018 winners have been announced by the board chair, Abdilatif Abdalla today January 23, 2019. The two are Zainab Alwi Baharoon and Jacob Ngumbau Julius. The Mabati Cornell Kiswahili Prize for African Literature was founded to recognise writing in African languages and encourage translation from, between and into African languages. The project founded in 2014 by Dr Mukoma Wa Ngugi (Cornell University) and Dr Lizzy Attree (Richmond/Goldsmith’s) is supported by Mabati Rolling Mills, Cornell University, East African Educational Publishers, Mkuki na Nyota Publishers, and The Africa Poetry Fund. Previous winners of the prize are Ali Hilal Ali and Dotto Rangimoto (2017) and Idrissa Haji Abdalla, Hussein Wamaywa and Ahmed Hussein Ahmed (2016). The shortlist for this year’s edition of the prize was announced on December 17, 2018 with three works of poetry and three works of fiction selected from 116 manuscript entries read by three judges. The three judges doing this arduous and vital job were Ahmad Kipacha, a Lecturer of Research Communication with the Nelson Mandela African Institution of Science and Technology in Tanzania, Natalie Arnold Koenings, a fiction writer, Swahili and English literary translator, and anthropologist at Hampshire College in Massachusetts, USA, and Rocha Chimerah, Professor of Kiswahili Linguistics at Pwani University, Kilifi, Kenya, a literary critic and novelist. Fiction: Zainab Alwi Baharoon (Tanzania) – $5,000 – Mungu Hakopeshwi. Meaning: God Doesn’t Waste/Borrow Time (an idiomatic expression in Kiswahili meaning God is swift in retribution). Poetry: Jacob Ngumbau Julius (Kenya) – $5,000 – Moto wa Kifuu. Meaning: Fire of the Coconut Shell (an idiomatic expression in Kiswahili because the fire doesn’t last long). Apart from the cash prizes, the winning entries will be published in Kiswahili by Mkuki na Nyota Publishers and East African Educational Publishers. The best poetry book will be published in English translation by the Africa Poetry Book Fund. The Prize will be awarded in Dar es Salaam, Tanzania on February 15, 2019. Previous Previous post: Veronique Tadjo to chair Orange Book Prize in Africa 2018 jury. Next Next post: Meet the team running Malawi’s Feminart Arts and Book Festival 2019.